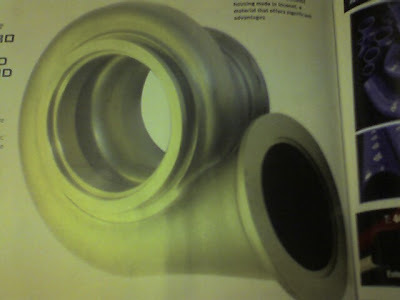 Just when you think twin scroll housings are the greatest things since sliced bread.. then you read Racecar Engineering August 2007 about WRC and Group N turbos , and you need to rethink some things. You see the all Inconel exhaust housings, the talks of other exotic and exciting materials used for wheels and compressor housings. They mention a Garrett Skoda WRC turbos weighs 4kg (about 8.8 lbs) vs a Group N MHI Evo 9 GSR turbo weighing about 10kg (22 lbs). Theres also some interesting discussion on twin scroll castings. They basically say that at high power outputs the divided housings distort enough to actually partially block exhaust flow to one side of the turbine. They say the Group N Evo housings are prone to cracking. While the twin scroll works on a street car , the demands of racing require a non divided housing. 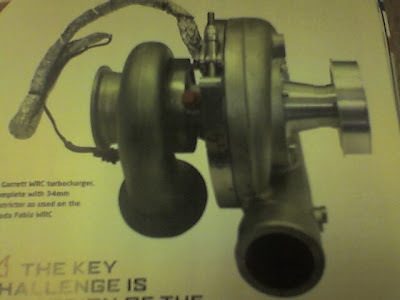 Now comes the hard truths , racing turbos , like all good real racing parts, cost real money. They say between 6000 - 12000 pounds ($12,000-$24,000) for a full WRC turbo where a Group N turbo costs about 1200 pounds ($2400).